For the crust: grind chia seeds and soak in water. In a meantime mix almond butter, agave syrup, ground almonds and spices. At the end add chia seeds and mix well. Stretch the dough carefully on a baking paper and the largest baking tray (30 × 40 centimeters). You’ll get the dough of 5 mm thickness. Put in preheated oven on 200 degrees for about 12 to 15 minutes, depends on the oven. Check using toothpick is it baked. When the dough is baked, remove it from the oven and cool. Cut to 4 equal parts. 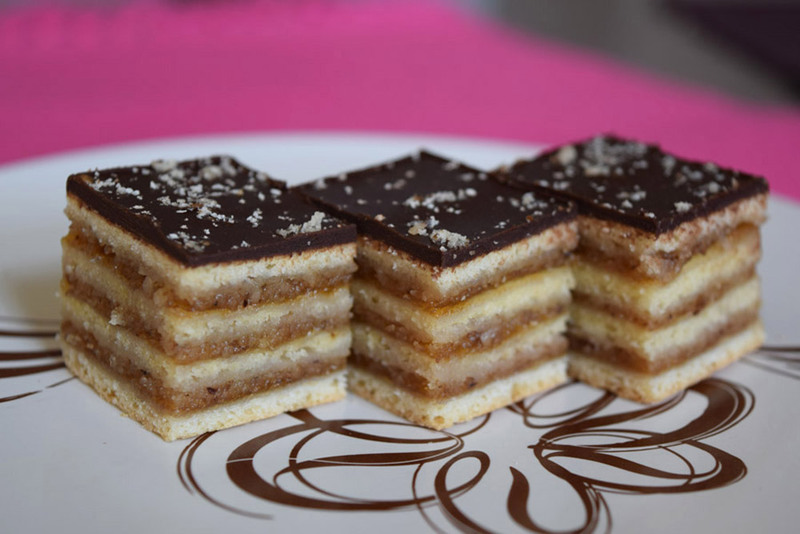 Coat each part except the upper one with thick layer of jam and with walnuts. Pour melted chocolate with coconut oil over the last part and leave in the fridge overnight. You’ll get 20 to 24 Gerbaud cubes.